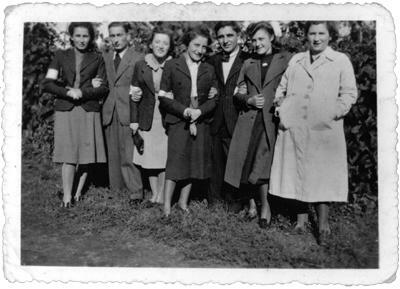 Holocaust Survivors: Photo Gallery - "Seven Friends Link Arms in the Ghetto"
These were 7 of Rachel Sher's young friends. This photograph was taken in the big Czestochowa ghetto. They are wearing blue and white Star of David armbands to identify them as Jews. All of them perished.